Urbanity is an arc-shaped shawl to go around your back and over each shoulder to show off the stairstepping edge on the front. It is knit from the top down with garter stitch surrounding the skyline-inspired tiers. This pattern uses a special method to bind off each tier and pick up stitches for the next tier, forming a chain-like edging. Creating drop stitches to start at different levels forming the skyline. Twisted stitches to help define the paths of the drop stitches. Expanding tiers for a stairstep effect on the sides of the shawl. Chained edge between the tiers by binding off and picking up stitches. 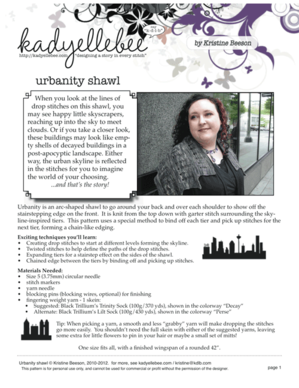 This shawl pattern has both charted and written instructions for whatever your preference!